This article was published on 08/13/2008. There are several different forms of character customization in role-playing games. These things can consist of equipping stuff on characters or customizing skills, and so on. 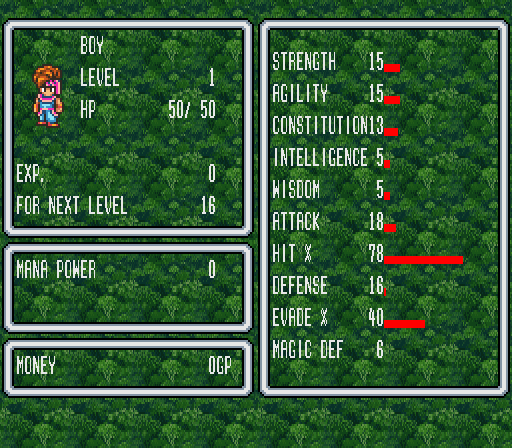 The messing about in menus bit is an important aspect of many RPGs, as it essentially comprises half of the game play. While sifting through menus can hardly be considered game play in normal terms, it is when the type of game is heavily based on character customization. This is especially true in games with menu driven battles, because even the combat involves menus. No matter what, it seems like you can't get away from menus in these games. 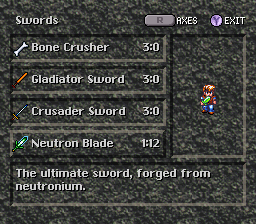 It is evident that customization is perhaps one of the most important and compelling aspects of an RPG, given that this is what menus are primarily for. Whether you live or die in combat can depend entirely on the decisions you've made when customizing your characters. I'm going to discuss a few different methods of character customization used in games. Let's get to it, shall we? 1) The first form of progression is the static method, which means every character has predetermined statistics and abilities. 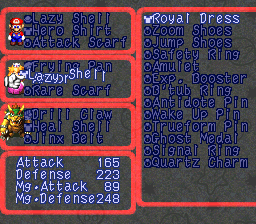 You can't customize anything beyond deciding which party members to bring with you or what equipment to give them. This method is easily the most common, and the least interesting. It keeps menu navigation to a bare minimum, potentially speeding up the game's pacing. Some games spice this up by giving you countless options in equipment and characters, but that often has its own consequences if not handled properly. It is rare for modern games to take this approach anymore, unless they're an action game. In fact, even action games are getting into the customization thing, so this method of progression is more a product of old school games. It's a great way to keep things simple, but RPGs that try this end up feeling a bit shallow. The lack of complexity hurts that genre the most, because there usually isn't much game play substance in the rest of the game. 2) The second method is when each character possess unique traits, but with a common modicum of customization. 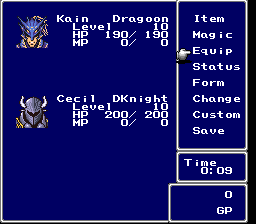 In this way, the player is free to customize their characters as they see fit. You can make them casters or fighters. Due to their innate abilities, these characters may typically be best suited for a particular role, or a set of roles, but you can still customize them. 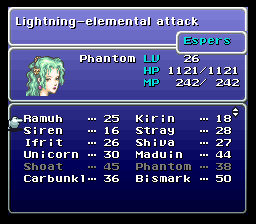 Perhaps characters typically geared for physical attacks can become mages that aren't entirely useless in melee combat, or you could simply make them better at what they did best. Many RPGs do this, in one form or another. The advantage here is that you have a little bit from both worlds; deep character customization with unique characters. I have to say that this is my favorite, by far. It's also the most wildly used, much to my enjoyment. 3) Another method is giving complete control to the player. The characters are merely blank slates for the player to build as he or she pleases. You might say that this is the best approach, but it has its fair share of flaws. For one, you won't feel that each character is unique. You can make it so that they're all the same, if you chose. At times, you may be finding yourself going well out of your way to make each character unique, when it would have been far more effective simply having everyone be an identical, superior fighter. That's unless you want to defeat your foes in style. There are quite a few games that use this method of customization, too. It can be difficult to find much incentive to make your characters different in these games. Some games come up with artificial rewards for making a varied party, but those end up doing more harm than good. As a player, I should create characters I find useful, not due to special rewards. This isn't the worst kind of customization, though. The fact that players are given so much freedom to create their own parties is a huge plus point. These games typically reward experimentation, as well, which is another overwhelmingly positive trait. The negatives of this method aren't too bad. 4) Finally, I want to cover what I refer to as "one way customization." This is my least favorite of the methods I've discussed thus far. Your characters level up, and as they do, you are presented choices in which abilities they should learn and which traits to boost. The catch is that everything you do is permanent. You can't go back on any of these decisions. That just presents a whole host of problems that stifles experimentation and potentially punishes creativity. Players adopt the role of a breeder and not a tinkerer. Instead of tinkering a character's traits, players are growing their characters in a certain way. One of the greatest joys in an RPG is to experiment with the system, not fearing that an irreversible, disastrous decision is being made. Anything which encourages exploration and experimentation in a game's mechanics is a good thing. Anything that does the opposite has missed the underlying basis of character customization. Unfortunately, a lot of developers utilize this method of customization. They do this in hopes that you'll play through the same game multiple times, so that you try out different customizations. Most of these games last over 60 hours, making this idea a developer's fantasy. Customization should evoke freedom. The key to this freedom is to reward experimentation as opposed to punishing it. That's really all there is to it. I can't say for certain which method of customization is the best, but I can say that the worst is anything that discourages its players to experiment with a game's mechanics. It's fine for games to employ punishment on a trial and error basis, unless the error permanently prevents you from trying again. That's just mean. 1,388,051 people love this site.